The word out of Mets camp doesn't sound too good. Ace pitcher Johan Santana who Hank Steinbrenner coveted is out indefinitely. It appears he may have tendinitis in his elbow, when I get more information I will post it. He hasn't gone for an MRI as of yet but it wouldn't be shocking if the Mets got him out of there secretly to do that, they are still downplaying this but if your a Mets fan, you have to be worried, if he is gone for a length of time during the season the Mets are in big trouble. The Mets take on the Tigers today at 1:05. I was going to post the Mets lineup for today but I can't seem to find it, oh well be back later with updates. The New York Yankees take on the Minnesota Twins again today this time from George M. Steinbrenner Field in Tampa. Joba Chamberlain gets the start followed by Kei Igawa,Dunn,Veras,Giese and others. The lineup for this game is: Damon Jeter Tex Arod Posada Cano Swisher Molina Cabrera Melky better get something going because Gardner is looking real strong and has passed him by in the CF battle so far. Posada is still the DH and won't catch until March 15. Today and tomorrow the big guys will play and then Cano,Jeter,Arod will leave for the WBC. The game is on YES today at 1 so I will have posts as I am watching the game. Arod also will meet with MLB investigators tomorrow about the steroids issue. The WBC will start up next week and be shown live on the MLB Network. Get used to seeing a lot of Berroa,Leone,Ransom etc for the next couple of weeks at least while the regulars are gone. Next week Team USA plays the Yankees and that will be interesting, the game will be on YES as Derek Jeter takes on the Yankees. Enjoy the game everyone and check back for updates during the game. Keep your eye out for my interview with AAA Scranton Wilkes Barre Yankees beat writer Chad Jennings. He does a great job with his blog at http://community.thetimes-tribune.com/blogs/yankees/. I should be posting it later tonight and if not for some reason it will be up tomorrow. The New York Mets lost their first game of the spring to the Cardinals 9-8 today. Luis Castillo had his first 0-fer of the spring. Livan Hernandez got the start and pitched 2 perfect innings with 1 K. Freddy Garcia followed him and didn't fare so well giving up 2 hits and 4 runs with 3 walks in 2/3 of an inning. David Wright and Jose Reyes didn't have any hits either today. Ryan Church had a double and Bobby Kielty had a HR. The Mets will play at Lakeland against the Detroit Tigers tomorrow. The New York Yankees lost their first game of the spring 5-4 to the Minnesota Twins. Ian Kennedy started and gave up 1 hit, 1 walk and had 3ks in 2 innings with 0 runs allowed. Jorge Posada continued his hot start with 2 more hits, Brett Gardner also looks to be out in front for the CF job as he had 2 more hits, a walk and stolen base. In the last 3 innings the Yankees pitching gave up 4 runs. The pitchers were Brackman,Kontos,De La Rosa and Jackson. Anthony Claggett who the Yanks got in the Sheffield trade pitched 2 innings giving up 1 hit with 1 strikeout. Austin Jackson had 1 hit in 2abs. Nick Swisher went 2 for 3, he has looked good so far in 2 games. Melky Cabrera was 0-3 and looks to be losing ground quick, he better start hitting soon or he will be a bench player. The Yankees will be back in home against the Twins tomorrow, Cano,Arod Jeter will all be back in the lineup, Joba Chamberlain gets the start. Francisco Liriano gets the start for the Twins. Manny Ramirez rejected the Dodgers latest offer yesterday which was for 2 yrs 45 million and a player option in the second year. Today Scott Boras is saying he will accept that offer but only if it is a real offer, it is thought that the Dodgers are trying to get sneaky and not really pay him that but spread it out over a few years. It will be interesting to see what happens here but they need him and he apparently needs them as he has had no other offers. The Mets got a bit of a scare yesterday when their Ace Johan Santana was scratched from a start with elbow stiffness, he will take the weekend off and try again on Tuesday. Hopefully it is nothing serious but you always worry when a pitcher has an elbow or shoulder issue. The WBC starts next week and players will start leaving their teams this weekend. I did watch the entire replay of todays game on YES tonight. I have some thoughts, im going to start by saying Robinson Cano looked great in the field while he was in there, making 2 outstanding plays, showing some range and hustle. I also noticed that Shelly Duncan still has some serious power and emotion. The pitchers, i am very high on Mark Melancon and liked what I saw out of him in his one inning of work, I think he may make the team out of spring training but if not you will see him up at some point this year. Brian Bruney looks just awesome, he has the potential to be lights out in the 8th and then people will forget about Joba if he is doing well as a starter. Jon Albaladejo also lost some weight and looks good himself, but I think its a numbers game and he wont make it. JB Cox gave up the only run and got hit around a little, boy has his stock dropped, he was a well thought of prospect and isn't thought of much anymore. Damaso Marte and Phil Coke looked good as well, I really think they will carry 2 lefties in the pen. I like the versatility Coke offers being able to start, short relief, long relief. What really stood out to me as I said before was that Phil Hughes fastball was popping and showing up at 90-92 on the YES gun which is pretty good for this time of spring, if he is healthy I expect him to be back up to 94-95 and with that he can be very effective. Ian Kennedy goes tomorrow in Fort Myers against the Twins, I don't think many regulars are going to be down there. Tex may go and maybe Posada but I don't think Arod, Jeter, Cano will play as they made the first trip. When I get the lineups and pitchers after IPK I will post it tomorrow morning. The New York Giants and running back Brandon Jacobs agreed to a 4 yr 25 million dollar deal. If you listen to GM Jerry Reese the Giants are going to bring back Plaxico Burress as long as he is a free man. Also Brandon Jacobs said he is all they need to win another Super Bowl. I think the Giants still should of won without him but they just couldn't adjust to life without him and hopefully they won't have to anymore. I forgot to touch on this yesterday but the Mets won their opener yesterday and also came back today and won in their grapefruit league opener. Luis Castillo has been the leadoff hitter and looks very good so far, having 5 rbi yesterday and a single, stolen base and 2 walks today. Jose Reyes batting third had 2 hrs, maybe Manuel is right batting him third. The only thing I would worry about is he trys to hit homeruns, his game is his speed and you don't want to take that away from him. Carlos Beltran also homered today, one thing noticed yesterday is all the hits to the opposite field the Mets had which the coaching staff has been working on with them and Jerry Manuel said its good for that to happen early as the players are likely to say wow I guess the coaching staff does know what it's talking about. The Yankees defeated the rays in tampa today 5-1. Phil Hughes pitched 2 scoreless innings, he did hit 2 batters but was just coming inside and hit them, not a big deal. Jorge Posada had a homer and rbi double in his first game, Shelly Duncan smacked a 3 run homer as well. Big Tex had a hit in his debut. I am going to watch the replay and have some more comments later on after I see the pitchers. I did notice that Phil Hughes looked really toned up, he looked good and it looked like his fastball was popping which is a good sign. Brett Gardners son and wife were in attendance today. He had gone 127 at bats last year in the majors without a homer and today he took the second pitch out. His 3 month old son Hunter won't remember it but when he gets older his dad can tell him about that in his first game. Gardner brought his son into the clubhouse to show him off after the game. There was no audio available after the game. Tomorrow the Yankees have their Home Grapefruit league opener with Phil Hughes starting. Melky will be in CF and Tex will make his Yankees debut at first base. Phil Coke, Mark Melancon,Jon Albaladejo, Damaso Marte and Brian Bruney will all be pitching also. The game is on YES at 1:15pm with a replay at 7:00, it will be great to see the Yanks back on TV. Reggie Jackson had some interesting things to say, how he is dissappointed in Arod and how he was 6th on the all time hr list when he retired and since then 5 guys have passed him by and most of these guys were juicing. He said he is a fan and that is why he takes the steroid issue personally and has even got in trouble for comments he has made but he is a fan and can't help it. The New York Yankees beat the Toronto Blue Jays 6-1 in their grapefruit league opener today. Dave Robertson loaded the bases in the ninth but escaped. Arod had a 2 run HR and 2 walks. The only pitcher to give up a run was Jose Veras who had a rough day with 2 walks, a hit and giving up a run. Arod said the crowd didn't bother him and that he hopes they bring the same people to fenway. I will be back later with some more notes from the game. 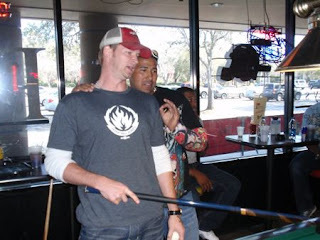 Here are the Pics from Today in Tampa. Yogi and Reggie arrived today. The team was hard at work after playing hooky yesterday. The New York Mets manager Jerry Manuel has been making some noise. The latest is yesterday he announced that rookie Daniel Murphy would be his starting leftfielder and that Ryan Church and Fernando Tatis would platoon in RF. He said earlier in spring training that he would use Luis Castillo in the leadoff spot and Jose Reyes in the second or third spot in the order. It will be interesting to see if he is just tring to motivate some of these guys or if he is serious. The Mets have otherwise been quiet. Jonathan Niese who is vying for the fifth spot in the rotation pitched 2 hitless innings in a intrasquad game yesterday. John Maine threw today and said his mechanics are rusty. JJ Putz pitched then jetted off to Arizona to be with his wife who is giving birth, he said he plans on being back on Friday to pitch against team Italy. The Mets will play the Orioles in Ft Lauderdale tomorrow in their grapefruit league opener. The only regulars making the trip are Luis Castillo, Daniel Murphy and Ryan Church. I thank http://metsblog.com for having this information. For the Mets fans check this site out it has great information regarding the Mets. Tomorrow against Toronto: Brett Tomko will start followed by Kei Igawa, Christian Garcia, Mike Dunn, Dave Robertson, Dan Giese and Jose Veras. They will pitch in that order. Thursday against Tampa at home: Phil Hughes will start followed by Phil Coke, Brian Bruney, Damaso Marte, Jon Albaladejo and Mark Melancon. They will pitch in that order. The traveling roster for tomorrow will be this Derek Jeter,Arod, Robinson Cano, Justin Leone, Eduardo Nunez, Ramiro Pena, Cody Ransom and Kevin Russo. Those guys are the infielders. The Pitchers will be the guys you see above along with Steven Jackson and Anthony Claggett. The outfielders making the trip are Shelly Duncan, Colin Curtis, Brett Gardner, Austin Jackson, Todd Linden, John Rodriguez and Nick Swisher. The Catcher are Jesus Montero, Kevin Cash, P.J. Pilittere and Austin Romine. Arod will have his first chance to see the crowd reaction in enemy territory and this is what he said today about that: "I have had a lot of practice the last eight years." " Hopefully just get three good at bats, get some good running in and go home and have a nice dinner." When he was asked about the upcoming meeting with MLB he said he had no idea when it would be that he has heard the same thing the media has, probably they have heard more. He said he is just waiting to hear from somebody, maybe Jean, im not sure. No one knows if he meant Gene Orza the MLBPA official or Jean Afterman the Yankees assistant GM. One last note I forgot before is that relief pitcher Edwar Ramirez has mild bursitis in his shoulder and will be shut down for the next three days. Today was the last workout with the Grapefruit league starting play tomorrow. The New York Yankees will be traveling to Dunedin, Florida to face the Blue Jays. Here are some notes from today: Jorge Posada will DH on Thursday. Hideki Matsui still has a little ways to go before he is ready to play. He will start his running program soon. Jorge continues to do well with his rehab, his arm strength appears to be good. The Yankees are very optimistic about his progress. Derek Jeter did all his running today and seems fine, he is ready to go for the WBC. Alfredo Aceves will start on Sunday against Cincinnati. 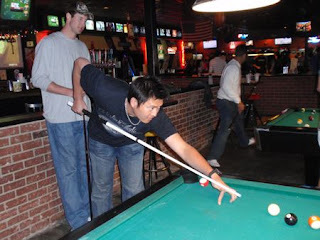 He ran the table off the break during one of the pool tournaments yesterday. Phil Hughes said " a shark". 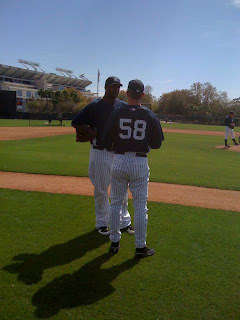 Bernie Williams was back in camp after a 3 day absence and took some BP. Arod, Jeter and Cano who will all be leaving for the WBC will play Thursdays game at home and skip the trip to Fort Myers on Friday. The New York Rangers who got off to a great start this year are in the midst of a freefall being only 2 points clear of 9th place in the conference. They are in danger of not making the playoffs and today they fired their head coach Tom Renney. I thought he was a good coach and I liked the way he handled things, but ultimately they didn't seem to respond well lately too him and also he had nothing to do with the personnel changes but someone has to be blamed and we know the GM Glen Sather is the owners pet and would never take any blame. It is being reported that the New York Rangers new head coach will be fiery John Tororella who led the Tampa Bay Lightning to a stanley cup in 2004. He was a former rangers assistant coach and his style would be a stark contrast to that of Tom Renney who was known as a laid back players coach. I think ultimately this comes down to the players but maybe this will be the spark that they need. I forgot to mention this before but Peter Abraham of the Journal News did ask Joe Girardi in the clubhouse today about Phil Coke. Phil Coke was told to prepare to be a starter but then of course the Yanks went out and signed CC,AJ and resigned Andy Pettitte. Joe Girardi said he is a reliever and that is how the organization now views him. Phil Coke said although he was always a starter he enjoyed being a reliever last year and would like to continue in that role especially if thats how he will make the team. I think there is a good chance he will make it and be a second lefty in the pen which i think is important. I do think Phil Coke can be this teams left handed version of Ramiro Mendoza as he could spot start, long relieve, face one lefty or pitch an inning. A guy like that can be very valuable and I expect Coke will be used in that way. There is no word yet on Edwar Ramirez shoulder, hopefully I will find out tonight and be able to post something about it later on. 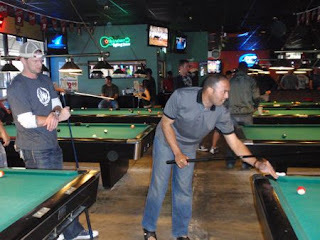 Mariano Rivera is not only the greatest closer of all time but a billiards champ as well. He won both tournaments today one with Phil Coke and the other with Andy Pettitte. What is there that Mo can't do well, it doesn't look like anything. The guys all seemed to have a great time today and I think this will go a long way in helping the players be a closer knit group, great job by Joe Girardi taking a cue from New York Giants Head Coach Tom Coughlin who went through a similar experience in 2007 and lets hope this leads to the same results a title at the end of the season. I am going to post some quotes from the guys below. Joe Girardi said this " I have never been on a team that has done this before, but I often wondered why." " There's a lot of other sports that do these type of things. We can get away from the park and enjoy each other off the field and get to know each other." Jorge Posada said this: " It's all about really getting together." " If I was a young man coming on this trip, it's something that you don't see often. You can hang out with the veterans and be away from the field." " Hopefully we start some relationships here and get going. We have a lot of young guys and we need to be on the same page. I think this is going to help us." Johnny Damon said: " Today is one of those days as a ballplayer you will never forget." I don't think any team has ever really done this. It says a lot about Joe. He knows we have been working hard and he rewarded us." Big Tex said " It makes you relax and realize we can have fun off the field. Once we get on the field its all business, but we can build some relationships as well." He also said it was the most fun day of spring training in his career. " I really think this was a great idea by Joe Girardi and shows he knows he had trouble last year with relationships and is going to improve on that, he is a good manager but needs to improve in that way and with the media and so far has done a good job. I think this is going to go a long way with his team. 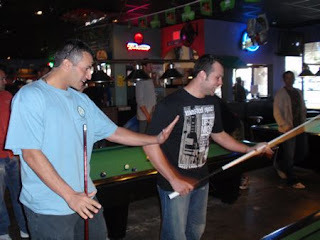 The Yankees found out around 9:30 this morning that thye wouldn't be practicing but instead manager Joe Girardi who apparently is a changed man decided to take the team to a local pool hall where they would participate in a 2 on 2 8 ball tournament. Here are the pics courtesy of the New York Yankees. I am sorry that the last post was so long but there was a lot of things to get to today and notice nothing about steroids which is great. I wanted to write this about Jorge Posada seperate because I think this is so important. It was a good sign today that Posada ended up throwing from 220 feet. " I threw a lot today," he said. " It feels a little better everyday. Tony Pena who is the catching coach as well as bench coach loves it and it feels good coming out of my hand. There's no pain and I feel stronger." Posada estimates he is at 85 percent. He wouldn't even be close to 100 percent at this point if he didn't have surgery so this is a great sign. Jorge is the fiery leader and you just don't find too many catchers that can hit like him so yes he is a huge deal. I am feeling more and more confident he will be fine but lets see how he is when he starts catching in games. The Pitchers for today were as follows: Melancon,Tomko,Hacker,Brackman,De La Rosa,Claggett,Jackson. The other group was: Hughes,Wang,Sabathia,Marte,Aceves,Ramirez CC was talking to some of the beat writers today and informed them that he is a Oakland Raiders fan. He played tight end in high school and was recruited by UCLA and Cal but was going to go to Hawaii because they were willing to let him play both baseball and football. "Then I got picked in the first round," he said. 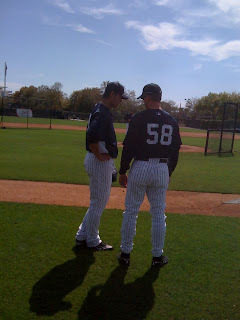 Mark Melancon was very impressive today according to Peter Abraham of the Journal News and http://yankees.lhblogs.com. He watched him pitch today to Derek Jeter,Robbie Cano, Austin Jackson and Austine Romine. He said his fastball was as advertised, he also threw five curveballs with 4 of them being strikes, its a big curve. He threw 30 pitches in all. The Yankees were very careful with him last year coming off of Tommy John surgery but he is now ready to be unleashed. I really think he has a good chance of making it out of spring training and if not he will be up by the end of the year, this kid has the tools and the makeup and may be the closer post MO.v Edwar Ramirez cut short his bullpen today due to a sore right shoulder. If this is seious at all which is too early to say then guys like Melancon and Robertson are going to have a really good chance at making it. The Grapefruit league begins on Wednesday for the Yankees and the pitchers for the first four games are set up as follows: Wednesday-Brett Tomko, Thursday-Phil Hughes,Friday-Ian Kennedy,Saturday-Joba Chamberlain. The main pitchers will be held back until late next week. Jorge Posada really liked what he saw from Melancon. He said his fastball had a late cut and that was what was leading to the swing and misses today. Posada also liked his curveball. He also said that Eric Hacker is a guy to keep an eye on, he throws 95 and its easy, very impressive. 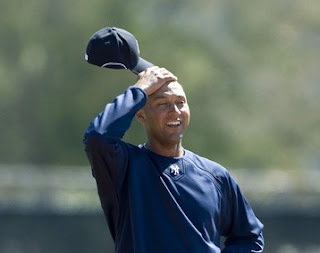 Derek Jeter has some hamstring soreness, it doesn't appear to be a big deal. I wouldn't worry about anything like this at this point, it really is no big deal, a lot of these muscles are being used now like they haven't been in a while.